Sony could launch 4K Blu-ray player later this month | What Hi-Fi? It looks like CEDIA could be the venue for the launch of multiple new Ultra HD Blu-ray players. 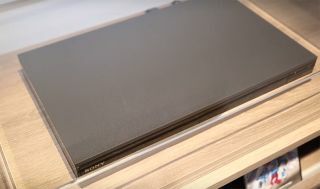 Sony revealed a glimpse of its first Ultra HD Blu-ray player at IFA in Berlin but it looks like the CEDIA show in Dallas in September could be the scene for the official unveiling of a number of new 4K Blu-ray players from various brands, including Sony. While the Sony stand at IFA was only showing a prototype 4K player, with very little information to go with it, Victor Matsuda, chair of the Blu-ray Disc Association’s promotions committee, suggested we could see multiple new 4K players in a matter of weeks. Speaking to What Hi-Fi?, Matsuda said: "The announcement is going to happen in a couple of weeks and hopefully more than one product. I'm expecting a couple of announcements from CEDIA." Any new Ultra HD Blu-ray machines would join the Samsung UBD-K8500 (£319), Panasonic DMP-UB900 (£599), the new Panasonic DMP-UB700 (£400) and the Xbox One S on the market. We could also see news from Sony next week in the form of the new PlayStation Neo, which is tipped to support 4K video, in line with the 4K Blu-ray-supporting Xbox One S. The PS3 was notably one of the first Blu-ray machines. We’ll find out more from PlayStation next week, while CEDIA takes place between 13th and 16th September in Dallas, USA. This article was updated on 8th September following subsequent clarifications from the Blu-ray Disc Association.